The "perfect" fire. Isn't that something that we all want if we're going to go to the effort of building one? To me the perfect fire entails one with minimal smoke, one that is burning efficiently enough that I hardly have any ashes left over, and of course, one that puts out plenty of heat. And that's exactly what I'm going to share with you today. There are a host of fabulous fire starting helpers out there that I insist on having on hand such as the magnesium/flint fire starter that’s so easy to have on me all the time; the simple do-it-yourself small blocks of fuel-soaked wood with a hole drilled through the middle, storm-proof lighters, or another do-it-yourself project of coating small pieces of tinder in paraffin wax (which is highly flammable), BlastMatch, gel fuel fire starters and of course the rather expensive starter logs and of course the cool granules known as “Fire On” as well as a myriad of others. Mind you, none of these items will make their way to the next “Survivor Island”, but there’s certainly many ways that we can START a fire. The trick that I realized that I needed to learn long ago is how to create a fire with minimal smoke, minimal ashes, low maintenance for security purposes as well as one that will put out plenty of heat. No problem. I've got ya covered. I learned how to make the typical Boy Scout fires from my husband, but in the midst of my prepping research I came across a way to make a fire that’s almost completely backwards from every method I had learned and I loved how it met all of my criteria! The embers it produces are AWESOME! I call it the “upside down” fire. 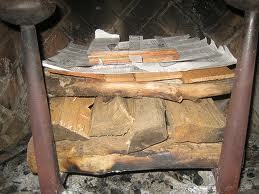 First you put a layer of large logs at the bottom of the fire spot, lying straight and next to each other, with no space between them at all. Ideally these will be unsplit logs. This is the point at which you’ll be determining how big your fire will be. The key to not having to manage and play with the fire is being sure to have your logs close to each other on each level. If you do that, you’ve got yourself a 3 to 7 hour fire depending on the amount of materials used. Next, lay a second layer of smaller logs on top of the largest ones, perpendicular to the first layer, and also making sure there’s no space between them. Ideally these will be split logs and you’ll want this layer to be just as wide and long as the layer directly beneath it. Next, lay flat pieces of wood next to each other, leaving no space between each other, perpendicular to the previous row. Ideally these will be sapling wood or cedar shingle wood. This will cover the entire length and width of the layer just below it. Now lay thick strips of CRUMPLED paper on your top, flat layer of wood, butted right up against each other, perpendicular to your previous level of wood. These strips will cover the entire length and width of your layer just below it. Newspaper is ideal for this level and you can even use small rolled newspaper logs. 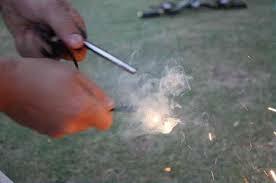 Lastly put 3 to 5 fire starter pieces such as the blocks, or oil sticks or clusters of fuel soaked lint balls. You want to make sure that the newspaper is crumpled enough that it kind of props up the fire starting material. You need just a slight amount of spacing here between the newspaper and the fire starting material. If you don’t have any firestarter materials, bummer, then go ahead and use the finest of burn materials such as dried leaves, lint, saw dust, etc. You need enough so that the fire will burn just fine at the top layer for about 10 minutes. And be sure to remember to give some spacing and gaps between this fire starter level and the newspaper/magazine strips. While there may be only a few days left in your area of cold and stormy nights, this fire will still come in handy on a cool summer night in which you’re camping in the hills. Be sure to actually practice this method so that you can be accustomed to it. Minimal smoke will mean that you’re not telling the whole freezing world around you that you’ve got heat and to spare, but you’ll certainly be putting out enough heat for long enough to keep several dozen bodies warm on a cold night, particularly if everyone’s feet are pointed towards the fire as they sleep in their bed bundles. And since the head is where the majority of heat is lost from the body, having everyone wear a winter cap to bed is a great idea to prevent a chill. Well, ya never know what you might need to know someday... Cremation might just be a goodie. Nope, can't say I did, but I have always wondered what would happen if I soaked the top part of the cat tail in rubbing alcohol or alcohol gel cause they always remind me of torches. I DID know about eating them but certainly didn't know about making them into flour. Woohoo! I love learning new stuff! You can still print the page, you just can't print just the article. ALL of my work is copyright protected and unfortunately there have been far too many who have taken the whole "sharing it with others" to the extreme to the point of compromising my ownership of my original work as they attempt to pass it off as their own. I work too hard for free to take that any longer. So we have to put some securities in place. This is similar to how natural cremation is done...the body goes on the bottom with wood stacked over it. Just what everyone wanted to know! Great article but this meathod of fire building isn't really new it's been around many years. I agree it's not "new to the free world" but it certainly is a NEW way of building to just about anyone who's been building them. hi kellene ~ regarding fire starters ~ i made over 3,000 fire starters this last summer using those little round 100% cotton cosmetic pads that the dollar store sells. there are 80 in a tube, and they stack up like pringles ~ very compact, unlike the ones made in the egg cartons with lint. i bought old candles and a shallow pan from the d.i. ~ then melted the wax, dipped the pads (holding them with hemostats) and set them on cookie sheets lined with foil. they cooled quickly and peeled off easily. great to add to the 72-hour backpacks. you just break them so the cotton pokes out and light them. they will burn for 7-10 minutes. they're great for starting the fire in our fire pit and saves alot of money on lighter fluid. i can't wait to try your wood stacking method the next time we're camping. thanks for the great info ~ agaiin. Great reminder and education for all of us. Thanks! I would also suggest if you are buying a wood burning stove for your fireplace you look at the wood stoves that have a catalytic converter on them. We purchased one quite a few years ago from Vermont Castings and they have no visible smoke because the converter burns it off. One of those babies will heat the heck out of a home too. I love the fire making(building) info you posted, I would love to be able to print it off to share with others, is there a way? Your name still on it of course. I start a fire every morning to heat the house. The very best fire starter in the world is the McDonalds takeout bag with the burger box, fries bag and napkin inside it. kind of crumble/krinkle it up into a tube shape about 10 inches long and build your starter fire around it. Second best is a 5 inch section of a waxed cardboard cream container. (one side about 3" by 5" not the whole carton). 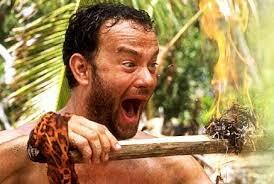 I have discovered that building up the entire fire from kindling to big sticks doesn't work well. It looks good and seems to make sense but it sometimes needs more attention just to keep it going until the bigger sticks catch fire. Instead I place two 2"-3" diameter sticks on either side and place the paper bag in the middle. A couple of sticks about the size of my little finger or smaller preferably cedar (I cut and split old fence boards about 6" long by 1/2" thick). After it is buring I place 2-3 larger sticks (1 1/2" by 8-10") pine is good. Allow it to get burning then a cross piece (across the two original sticks on the side) and now it is ready for the bigger pieces and from there on it is just a matter of adding wood as needed. Another hint; save the largest straw you can find (7-11 big gulp straw) and as the paper is burning if it isn't really cooking blow at it directly with the straw to make it blaze up. This will catch the kindling. Blow gently but continuously so you don't disturb the kindling. I do sometimes start my fire using a fire stick instead of a match just for the fun of it. Get hold of a ten pack of full sized Bic lighters. Each lighter should give you about a thousand lights which is almost enough for 3 startups per day for a year. Seven lighters for seven years. The three extra are for redundancy/back up purposes, or if you need more than just a couple of seconds per light. Also recommend multiple types of fire starters such as 9-volt battery and steel wool, flint and steel, to name a few. My favorite is building a fresnel lens. Like a magnifying glass only bigger, faster, hotter. Once had a butterfly enter the kill zone and it flamed on like Johnny of the Fantastic Four, but only for a few seconds...then it was gone...disintegrated. Be careful, a really big one can set you on fire almost instantaneously near the focal point.